HTC might be on the verge of launching the refresh to its five star HTC One handset, but that doesn't mean it has forgotten its other customers (you know, those who can't afford £500) as it looks to take on the budget market with a new Desire model. Suggestions that HTC is planning on launching a new budget model first surfaced last week, and today more details have emerged giving us a rather colourful taste of what is on offer. Chinese site ePrice has been passed pictures apparently showing a new HTC handset in a variety of colours (red, orange, blue and yellow), leaving it to take to take on the incredible budget Moto G handset. 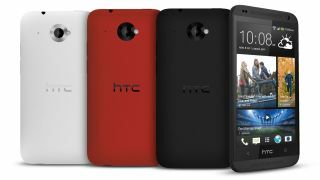 ­The new handset is expected to include a 5-inch 720p HD screen with an 8MP camera, leaving the UltraPixel technologies to remain on the high end HTC One range. The upcoming Desire will apparently run Sense 5.5 over the top of Android 4.3 Jelly Bean, leaving it lagging behind the KitKat toting Moto G.
The leak also suggests that a MediaTek octa-core processor and 1.5GB RAM will also come inside the upcoming budget handset, retailing at 2000 Yuan (around £200, $330, AU$380). While we can't vouch for the authenticity of the shots - so take the report with a decent pinch of salt - we may be looking at an MWC 2014 launch for this handset. Does the HTC Desire 500 warrant a baby brother?